Achren have now been confirmed to play at Rock’n’Roll Tattoo Fest on Sat 26th May at Beat Generator in Dundee. “It is with a heavy heart that we have to inform you that Forces Of Metal 2012 will not take place. We’ve tried; tried hard, but to no avail. Certain events, starting in December 2011, have caused a downward spiral from which we could not recover. We’ve considered alternatives. None of which seemed to do any justice to our initial plans or to your expectations. We are proud, though. Proud of the bands we’ve booked and the effort they have put into our festival. Proud of all the people who believed in our cause and shared our dreams. Very proud, indeed, of those who purchased tickets, even when things went pear shaped. Additionally, we understand that some of you had questions and critique when pivotal acts cancelled. We thank you all, most sincerely. Is this the end? Will there be a Forces Of Metal 2013? Really, we don’t know. It’s too early to tell. The dream hasn’t died, though! A battle is lost, the war continues! 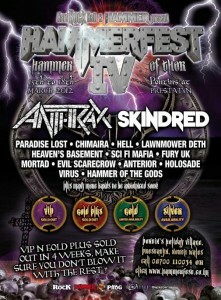 We are happy to announce that we are now confirmed for Hammerfest IV ‘ Hammer of Thor’ at Pontins Resort, Pestatyn, North Wales on the weekend of 15th – 17th March 2012. The bill over the weekend already includes Anthrax, Paradise Lost, Hell, Exodus and many more. The provisional date for our show is Saturday 17th with stage and time to be confirmed soon.